Denis J. Hoolahan was a canny yacht broker, perhaps unsurprisingly considering his Irish background. 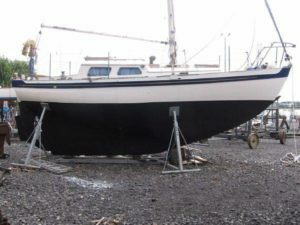 When he began to import teak-built Vertues into the UK from Hong Kong in 1963 his foresight paid off, for that first boat, Hoitak, was followed by at least thirteen more over the next two years. 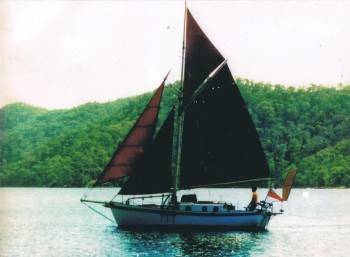 I learnt to sail on Hoitak, which is the Cantonese for ‘Vertue’, and have had a soft spot for these particular boats ever since. I am reluctant to be too categorical about Vertue facts, as it’s early days with this website, and we’re still learning. However it does seem that one of the first Cheoy Lee boats was Bettina V 58, which was built in 1953. I have verified another twenty boats built up until Phoenix, V 145, built in 1967. I am sure there are more, and if anyone can tell us about them, do please get in touch. They were beautifully built of a local teak, and Vertuosa V 122, still has varnished topsides after 53 years in commission! See the amazing Cheoy Lee association website run by James and Cilla McGarvey. Whilst Moodys at Bursledon built the first Vertue, Elkins in Christchurch, just along the coast from Jack Laurent Giles design office in Lymington, clearly built the most English boats. They must have got quite good at it as they seem to have built around twenty up until 1962, when my own boat Raumati V 112, was launched. Like many of the Elkins boats she has mahogany topsides, teak bottom planking down to the elm garboards, a lead keel and bronze floors. 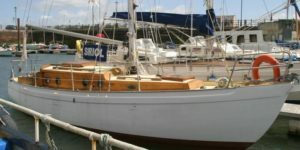 Newman in Poole were the third most prolific boat yard building these boats, although at least another 19 UK yards built one or two boats each. Of course many Vertues were built as ‘one-off’ projects and I have records of at least half a dozen in Australia and a similar number here in the UK. Others were built in the USA, Holland and South Africa. 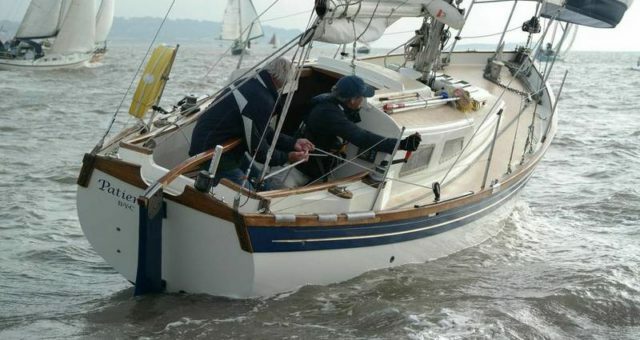 Finally, two steel Vertues were built by Hitters and Proost in the Netherlands, and one of these Virtue V 61, is lucky enough to have her very own website, vertue61@wordpress.com , which is enthusiastically run for her by Ben Deveson. A third steel boat is said to have been built but we have no details of her yet. Icebird V 45 Ocean coachroof Built Aeromarine 1952. 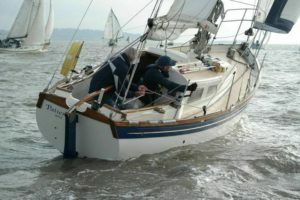 Kirkcudbright,Solway Partnership Yacht Brokers. Asking £18, 950. Ariel V 90 built 1958, lying Galesville with a $35,500 price tag. But the broker is unclear. Patience VII 9 Built by Bossoms1986 Lying Barry, Wales. Owner Roger Donkin at rogerdon37@gmail.com. Asking £20,250. Roger has done lots of really good work to the boat over the years so this one is great value at that price. If you have a Vertue for sale we are thinking of making these notes a regular feature so please get in touch, and we welcome feedback from brokers, owners and prospective owners about developing this service.